Spinach is a great source of iron, Vitamin A, C, K , magnesium and many more nutrients. To preserve all these healthy nutrients, blanching is great for vegetables. It helps intensify the taste and bright color of vegetables. Blanching locks in both – flavor and the nutritional value of the veggies. Blanching is a very easy process. Add leafy vegetables like spinach, to a pot of hot water, let it sit for 2-3 minutes or until leaves are soft. Spoon them out and give a shock treatment by dropping spinach in a bowl of ice cold water. This will stop the cooking process, intensify its color and bring out its flavor. After the ice treatment, remove spinach from water, squeeze out all the excess water and store it in a ziploc bag and freeze. Since I was using my blanched spinach for a recipe, I have pureed it. This way you can blanch any vegetable – green beans, asparagus, spinach, mustard leaves and many more. Follow a step by step guide on how to blanch spinach leaves? Let’s begin with the process. 1. Clean and trim spinach leaves. Wash them thoroughly under cold water. 2. Boil water in a pan. 3. Add spinach. Let it boil for 2-3 minutes. 4. Using a slotting spoon remove spinach and..
5. Plunge into a large bowl of ice water. 6. This will stop the cooking process. 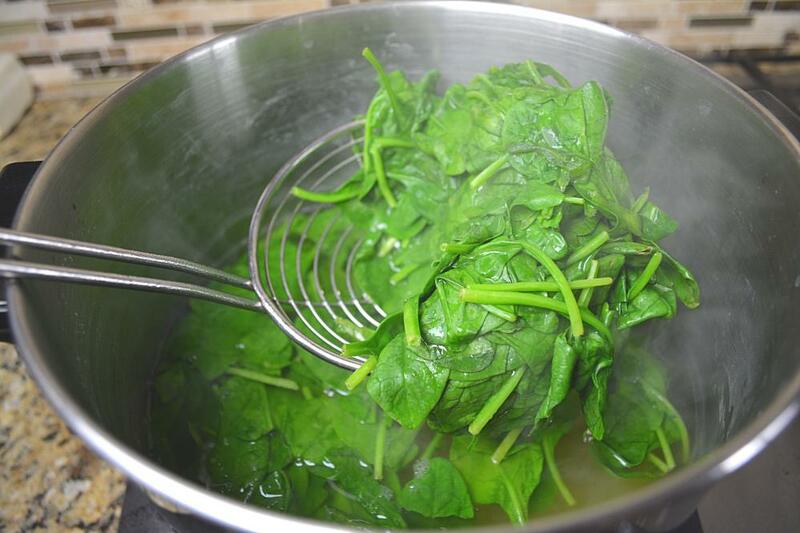 Remove spinach from water and tightly squeeze out all of the excess water from the spinach leaves. Form a small ball and store in a Ziploc bag. Freeze for future use. 7. Blanched spinach is ready for use. Toss in Ziploc bags and freeze for future use. 8. Save the water in which spinach was boiled. Do not throw it away – use it in any of the spinach recipe. That’s your SPINACH BROTH. Simply described. Lovely pictures. I love the recipes and the site. Thanks for posting this great tutorial. It was a great help! Great site, great information and above all great presentation. Liked it to the core! Brilliant work Ruchi. Ruchi, you make everything look so simple and easy. Your recipes inspire me to cook. Blanching was so easy never knew that. Thanks. Thanks for your feedback Curtis! !